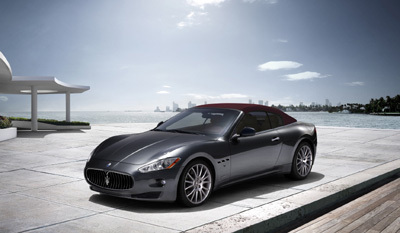 Maserati is pleased to announce the approved pricing of £95,630 (OTR) for the Maserati GranCabrio. It can be ordered now via the Maserati dealer network and the first right-hand drive examples will reach the UK showrooms in April 2010. The GranCabrio represents the very essence of Maserati in terms of open-top cars. It’s a Maserati in the purest sense of the word and a car with a high emotional appeal: from its luscious looks and Pininfarina styling to its V8’s thrilling sound and amazing performance. Powered by a 4.7 litre V8 delivering 440 HP, the GranCabrio features a ZF automatic six-speed gearbox and is the convertible with the longest wheelbase on the market (2,492mm). It reaches 100 km/h (62 mph) from standstill in 5.4 seconds and has a top speed of 175 mph. The GranCabrio continues the Maserati tradition in open-top cars and joins models which have played an important role in the Modena carmaker’s history such as the A6G Frua Spyder (1950), the 3500GT Vignale Spyder (1960), the Mistral Spyder (1964), the Ghibli Spyder (1968) and the Spyder designed by Giorgetto Giugiaro (2001), the car that marked Maserati’s return to the United States. Whilst following in the footsteps of tradition, the GranCabrio opens a new chapter, because never before have four-seater convertibles been produced at the Viale Ciro Menotti Maserati factory. Four proper seats, so that the rear passengers are not merely supporting actors, but co-stars of the journey. Maserati offers an unrivaled personalisation programme, which has been developed with the objective of allowing each client to create a made-to-measure car. Such a level of exclusivity is a source of pride for Maserati, a small company able to devote the highest levels of care and attention to every car it builds. The personalisation options on the GranCabrio, which is available in 14 different exterior colours, have been enhanced by six different shades for the soft top and by the introduction of two new Poltrona Frau leather colours, Bianco Polare (Polar White) and Blu Profondità (Deep Blue). The dashboard, door panels and rear side panels are available in the new ‘Dark Chrome’ standard finish but it is also possible to choose from precious woods, such as Carbalho and Moonwood, or coloured lacquer finishes. The GranCabrio style is unique; the possible combinations for colours and materials are endless. In addition to the wide range of options, a bespoke four-piece leather luggage set which fits perfectly into the boot is available to order. The trolley suitcases can be ordered individually and can also be fixed on the rear seats with a security belt and an elegant leather cover will protect the seats.